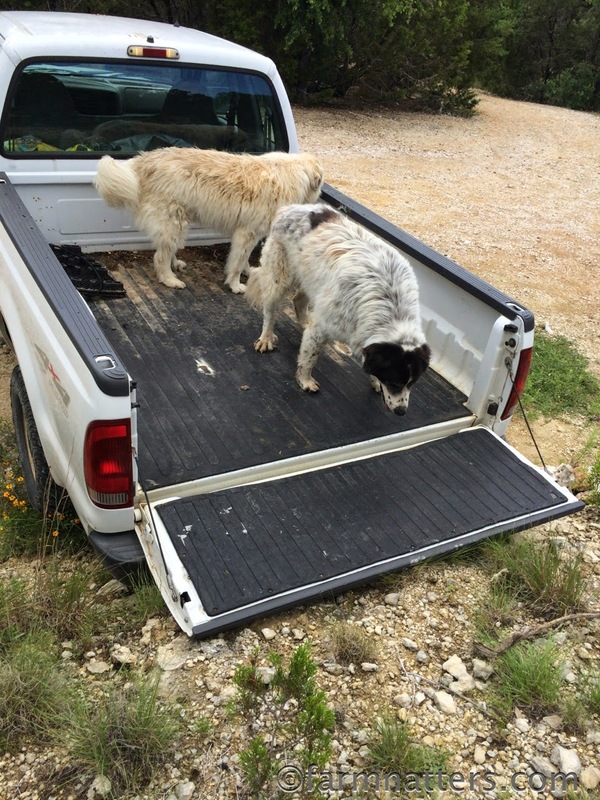 It was easier to get Bandit into the cab of the truck instead of the bed, because the used utility truck we own was/is jacked up for bushwhacking. Though the truck bed tailgate is out of easy reach, Bandit can get her paws up to the cab floor. Once she's on her hind legs, all I need to do is lift her arthritic hips, and let her walk forward. Her sister Maggie can jump into the truck cab all by herself, so this should be easy, right? Yeah. You know where this is going. In the interests of efficiency and saving time, my keys, purse, phone, and full travel mug of coffee are placed in the cab's center console before getting Bandit inside. From there, as they say, "chaos ensues". 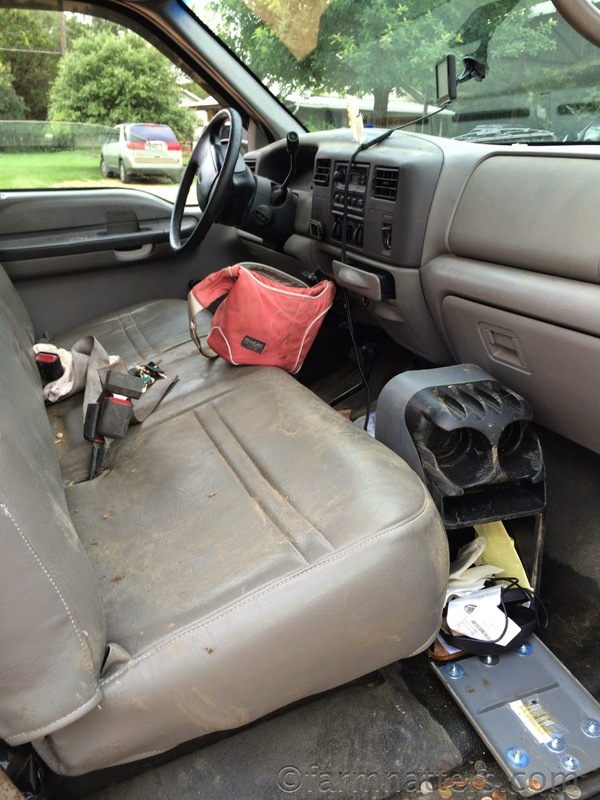 Center console with coffee and purse overturns as Bandit gets into the truck and decides she is going to drive. Bandit's paws and underbelly also happen to have soil all over from digging up a cool spot under the trees, so soon there is soil mixed with coffee mixed with nervous dog saliva all over the vinyl seats, floors, and dashboard. Swell. No time to do more than wipe the driver seat with a nearby towel, and off we go to the vet. Bandit continues to insist on driving, or at the very least sitting on my lap en route. I strong-arm her aside for the blessedly short 2.3 mile drive, while giving thanks for automatic transmission. Bandit is the poster-dog for pet-seat restraints. We get to the vet. I step out of the cab and get ready to leash her when she leaps from the truck seat and starts a panicked run off the vet property. Gawds, this day is getting better & better. A vet tech witnesses the commotion, and makes an end-run before Bandit heads into the local subdivision. So glad she loves the vet techs. Bandit practically drags me into the vet office after capture, trailing the tech. I pick Bandit up later that afternoon. The tech helps me lift Bandit into the truck bed instead of the cab, as I still don't want anyone but myself driving. I bungee Bandit's collar to a tie-down in the truck bed to deter a potential suicide leap while on the drive home. I was not looking forward to lifting her out of the truck bed by myself, but I'd rather get her home safe and deal with a torqued back from lifting than wrestling the wheel with her on the road. Party pooper, I know. Photo: Bandit is unbungee'd at this point, I swear. Here we get to the redemption part. Perhaps some rare moment in the past when I wasn't crabby, I made someone smile and accrued some positive vibes. Don't know how else to credit the idea that pops into my head on how to get Bandit out of (and in the future, into) the truck bed. Next to our driveway is a section of deep/high cutout on the hillside. I back the truck up to the cutout, and drop the tailgate. It lines up perfectly with a level patch of ground. Maggie, excited to see her sister, bounds up the gentler part of the slope and runs into the truck bed to get a good sniff of Bandit. I stand around feeling smug, admiring my handiwork, then wonder why Bandit isn't leaving the truck. Oh, right. She is still bungee'd to the truck bed. Bless the unconditional love that dogs give us. I'm not sure how Bandit survives our relationship.